He born in Bangkok on March 31, 1788 the future King Rama III was the son of King Rama II by a junior wife, Chao Chom Riem. At the time of the death of King Rama II his supposed heir, Prince Mongkut, had entered a monastery as a monk and Prince Chesda Bondindra, as he was then styled, was chosen as king by the Accession Council [ at the age of 37 and reigned for 27 years ]. He proved an able ruler and during his reign trade prospered and territorial advances were made as the vassal states of the north and east came more firmly under the rule of Bangkok. During his rule, in 1833, the first treaty with the United States was signed. King Rama III had no queen and thus had no children of Chao Fa rank, and so, on his death, on April 2, 1851 [ at the age of 65 ]. 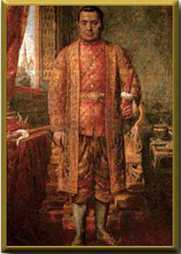 The succession passed to his half-brother, who became King Mongkut [ Rama IV ]. Although he had no son who was King it is an interesting genealogical fact that among his descendantes were five future Kings for his granddaughter, Queen Debsirindra, was the mother of King Chulalongkorn [ Rama V ]--thus every descendant of King Chulalongkorn has a lineal descent from King Rama III. "RATTANAKOSIN BICENTENNIAL" An Iiiustrated Book on Historical Events, published by KURUSAPHA BUSINESS ORGANIZATION, 1982. KING BUDDHA YOT FA CHULALOK, Mahidol University, "http://www.mahidol.ac.th"